I receive lots of emails from readers wanting to know how much a motorbike road trip through Vietnam will cost. Below, I’ve put together a list of necessary expenses and worked out what an average daily budget might be while on the road in Vietnam. These costs are based on hundreds of road trips that I’ve taken – both solo and in a group – over many years of motorbiking in Vietnam. 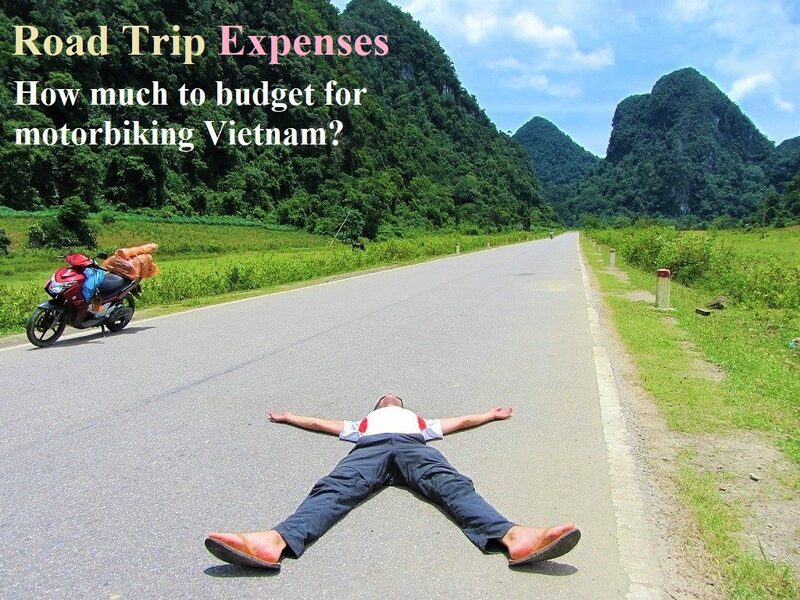 Of course, to a certain extent, expenses for a motorbike road trip in Vietnam will depend on how much you want to spend. 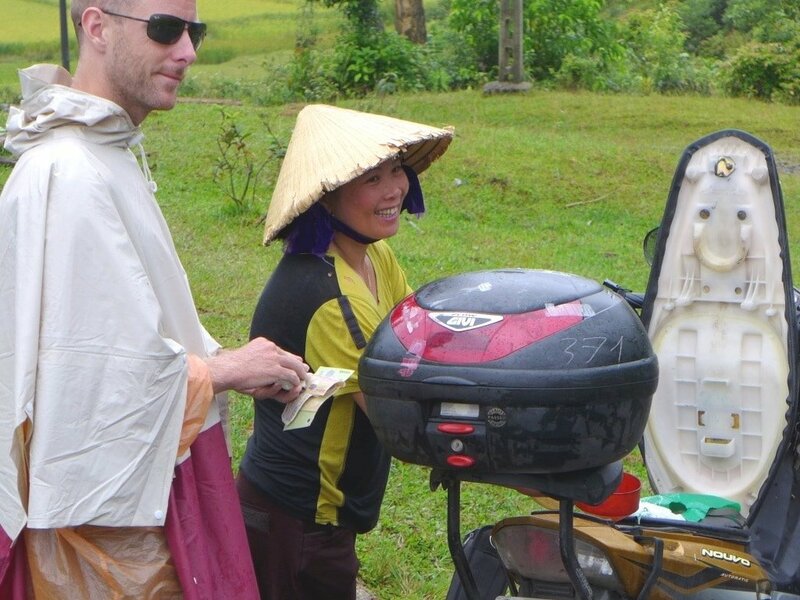 In general, I have assumed that most travellers on motorbike rides in Vietnam fall into the budget to mid-range category, and are willing to stay in local guesthouses and eat local food. I have estimated the following prices accordingly, so you can relax and stay within your budget. 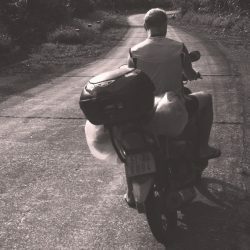 Below I’ve outlined all basic daily expenses for a motorbike road trip in Vietnam, followed by an estimated total daily budget. 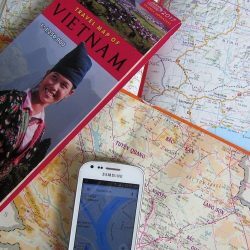 For more useful resources for planning a road trip in Vietnam, take a look at the Related Posts. A motorbike road trip through Vietnam is an unforgettable experience: but how much does it cost? One of the biggest expenses will be your motorbike. For this, there are two options: rent or buy. However, the rental market in Vietnam is increasingly sophisticated, and the only real reason to buy your motorbike is if you’re particularly keen on the idea of ‘owning’ it, or if you’re planning on travelling for more than a month. Generally speaking, if you rent a motorbike the cost will be around $10 a day for a standard automatic or semi-automatic model. (But if you plan on renting a bigger, more powerful motorcycle, prices are significantly higher.) If you buy your motorbike, the cost will be around $200. Please note: in the right sidebar and bottom of this page, I advertise for specific motorbike rental/buying companies that I trust, have personally used, and vouch for. These companies all offer excellent services and I highly recommend contacting them for full details about their bikes and prices. 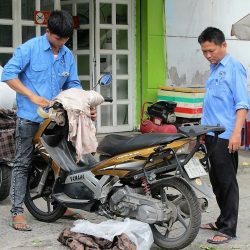 RENT: If you choose to rent your motorbike, you should do so from a reputable company: Rent a Bike Vietnam, Tigit Motorbikes, Dragon Bikes, and Style Motorbikes are all professional, efficient and reliable rental services, and they can arrange pick-up and drop-off in specific locations around the country. Rental costs per day will depend on what kind of motorbike you want. But, for the most common motorbikes – standard automatics or semi-automatics – the average cost per day is around $10. You will need to pay a deposit (or in some cases the full amount) before you set off. Style Motorbikes, Dragon Bikes, Tigit, and Rent a Bike are all highly experienced with years of service behind them. These days, the rental process is very streamlined and easy to follow. Increasing demand and competition is continually raising the standards of motorbike rental in Vietnam: it’s now easier and better value than ever before. 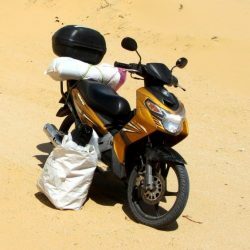 BUY: You can buy a used motorbike, such as a Honda Win, for as little as $200 by scouring the backpacker areas of Saigon and Hanoi, and searching traveller forums. But you will likely have to spend money on maintenance before and, most probably, during your trip, which, aside from being a nuisance (and a safety risk), will increase the costs considerably. You will also lose a couple of precious days at the beginning of your road trip trying to find a suitable bike to buy, and, at the end of your road trip, trying to find a buyer to take it off your hands. Unlike the rental companies, who have a vested interest in keeping all their bikes well-maintained and in good condition because they will be using them again and again, when you buy a bike from a random garage or backpacker, their only incentive is to sell their bike as quickly as possible, regardless of quality, condition, or value for money. 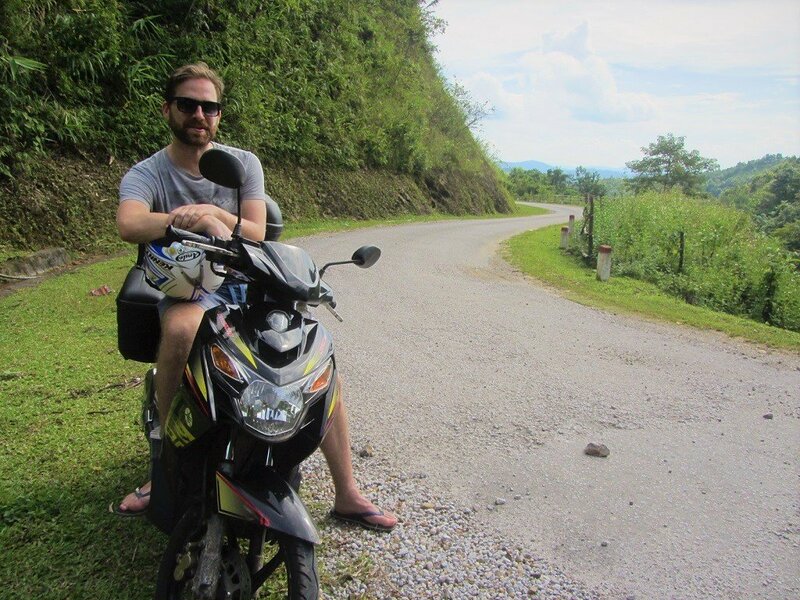 My advice is to rent, unless you intend to ride Vietnam for an especially long period of time, or if you know enough about bikes to make a good assessment of the quality of bikes for sale. 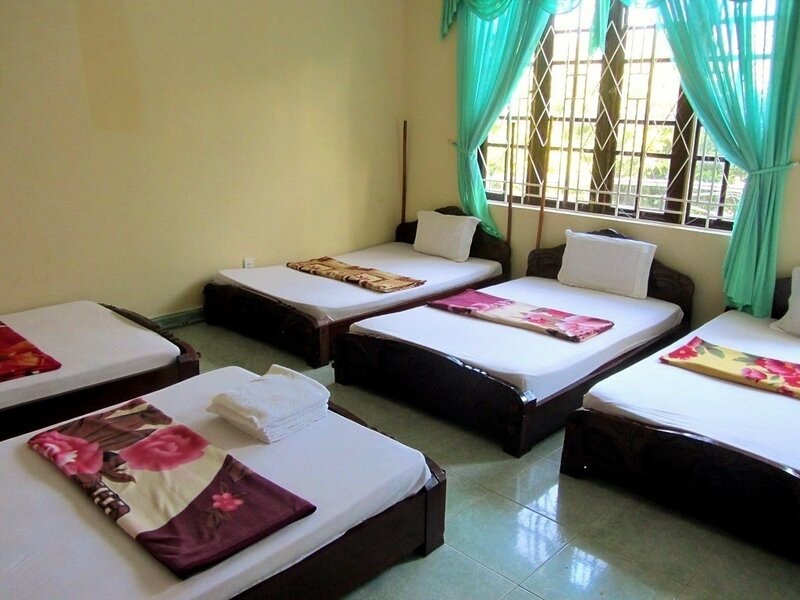 GUEST HOUSES & HOSTELS: Unless you’re sticking entirely to the beaten track, you will be spending many of your nights on the road in nhà nghỉ (local guesthouses). These can be found all over the country – even in the remotest regions – and are usually great value for money. Averaging 200,000-400,000vnđ ($9-18) for a double, twin, triple, or quadruple room, they are particularly good value for couples, two travelling friends, or a small group of travelling companions. If you’re travelling alone and you bargain politely you should be able to get a room for 150,000vnđ ($7). (For much more about nhà nghỉ read my guide to local guesthouses here.) 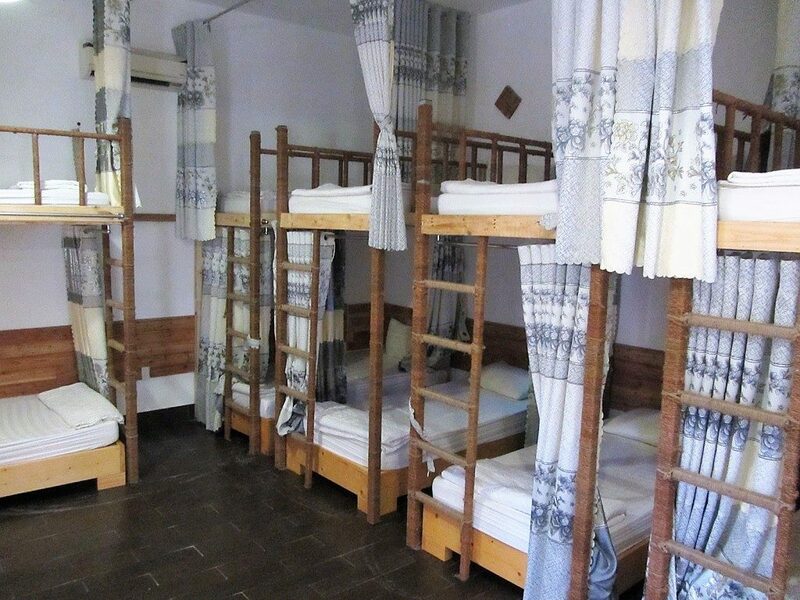 In well-established tourist enclaves, such as Saigon, Dalat, Mui Ne, Nha Trang, Hoi An, Hue, Phong Nha, Halong, Hanoi, Ha Giang, and Sapa, there are a good number of classic backpacker-style hostels, offering dorm rooms starting from $5 a night. 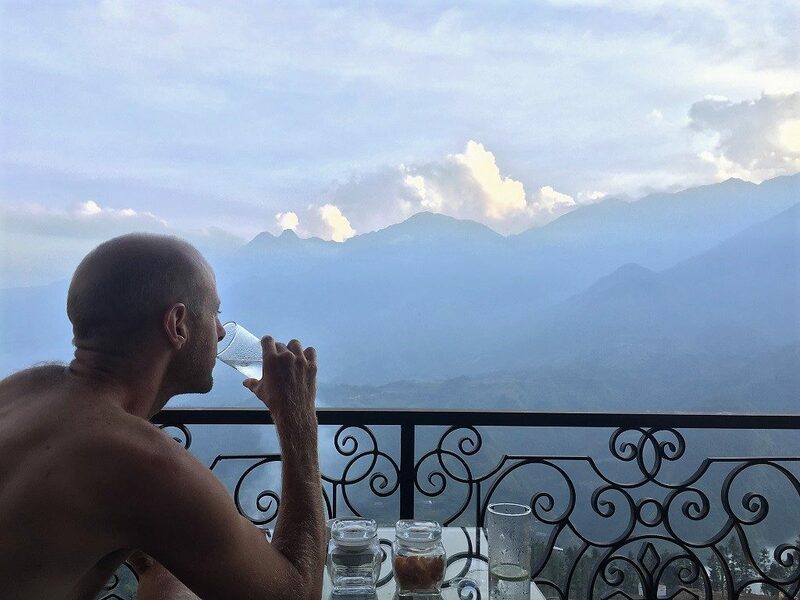 HOMESTAYS & AIRBNB: In certain regions of Vietnam, particularly in the northern mountains, homestays in traditional wooden houses offer some of the cheapest (and most atmospheric) accommodation available in the country. 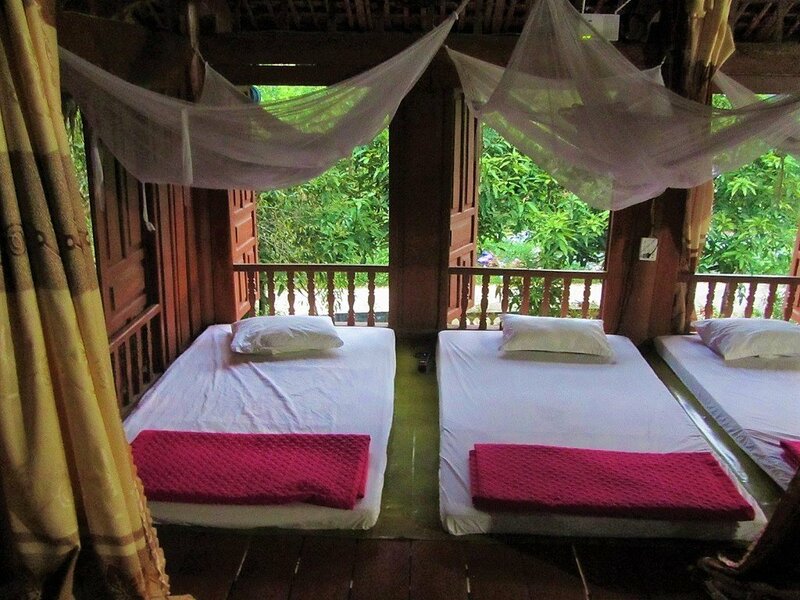 The price for a mattress on the floor under a mosquito net in highland destinations, such as Ha Giang, Sapa, and Mai Chau, can be as little as 40,000-80,000vnd ($2-$4) a night. 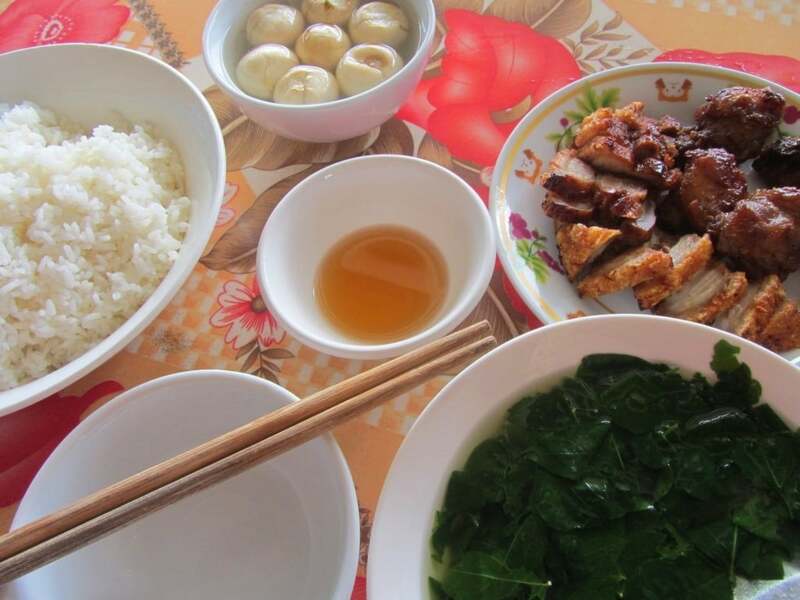 Of course, you are also expected to buy into the family-style dinner (which would put the price up by at least 100,000vnd), but, if you’re on a tight budget, there’s no reason why you can’t just pay to sleep and not eat. Homestays are becoming more common throughout Vietnam, even in lowland areas such as the Mekong Delta, so it’s always worth seeking them out. (To get an idea of what homestays are like, take a look at my Homestays Archive.) Airbnb also lists some surprisingly cheap homestay-style accommodations, so checking their listings wherever you are in the country is worthwhile. CAMPING: One way to significantly reduce the cost of accommodation is to camp. This is definitely an option, especially on remote stretches of road, such as the Western Ho Chi Minh Road, or where there are designated campsites, such as the Ocean Road, and camping can be an extremely rewarding experience. However, if you intend to ‘wild camp’, it does mean taking more equipment on the back of your motorbike and you should be very careful when choosing a site to pitch your tent. For more about where and how to camp in Vietnam take a look at my Camping Archive. 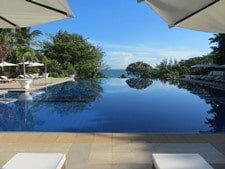 HOTELS & RESORTS: Mid-range travellers will find plenty of hotels and resorts in all cities and popular tourist destinations, but not in more out of the way regions. If your accommodation budget stretches beyond $20 a night (or if you’ve had a particularly hard few days of riding and want to recuperate) there are some very good value mid-range hotels across the nation, but of course your general budget will suffer as a result. However, I still think it’s worth splurging occasionally – it’s a lot of fun. 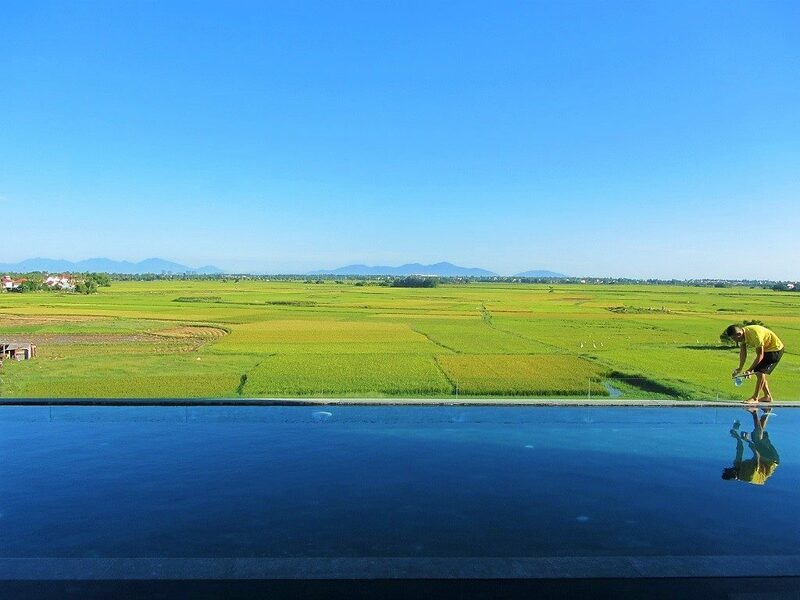 For some examples the kind of mid to high-end accommodation available in Vietnam, browse through my Hotel Reviews Archive. How much you spend on gas will depend on the distances you intend to cover each day, and on the type of motorbike you’re riding. A long day on the road in Vietnam is around 300km; a short day is around 100km. Of course there will be days when you will be static and this will offset the average daily cost for gas. Most standard motorbikes have a 3-5 litre tank which will take you around 100-250km, depending on the condition of the motorbike and the terrain you’re covering. At the time of writing (March 2018) gas prices were creeping up again, at around 20,000vnđ per litre (less than $1). A full tank costs between 60,000-100,000vnđ ($2.50-$4.50). On average – over your entire road trip, taking into account the days that you will be static – you will probably only use one tank of gas per day. Allow at least a few dollars per day for extra costs. These might include entrance tickets for attractions, sites, museums; minor motorbike repairs, such as a flat tyre; roadside snacks like a packet of biscuits; and lots of water to keep you hydrated. Also, leave room for some ‘luxuries’: a sunset cocktail at a smart beach bar, or a Western meal in a big city after days of eating rice in the mountains. Bear in mind that the calculations below include the cost of your motorbike, which, in reality, will be paid as a lump sum at the start of your trip: either when you pick up your motorbike from the rental company, or when you buy your motorbike. The following estimates are per person, per motorbike, per day. Travelling two on a motorbike or travelling in a small group will significantly reduce the average daily cost, because you will be sharing the expenses for room, food and gas. 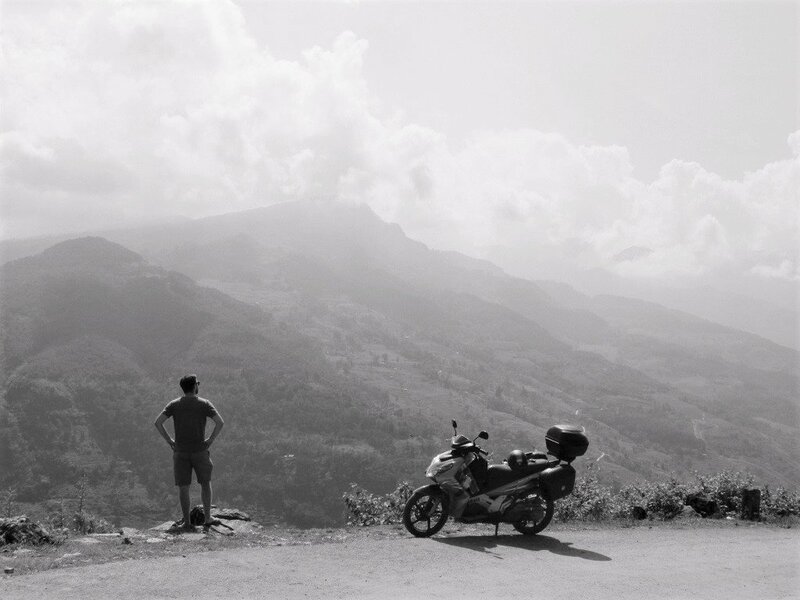 This entry was posted in ALL, MOTORBIKE GUIDES, Resources and tagged blog, cost, expenses, how much, motorbike, motorcycle, road trip, travel, Vietnam. Bookmark the permalink. It’s best if you contact the rental companies that I recommend on this page above to ask about that – they will be able to give you some advice regarding riding with/without a license. any ideas what to do with our big backpacks? Is there any company that would send our bags from Dalat to Ho chi min and store them for 2 months? Do you know how to do this for a reasonable price? I’m not sure about that. You could ask your motorbike rental company if they have any suggestions – my recommendations for rental companies are listed above. I am planning my trip to vietnam for 21 days from mid march to early april 2019. I would like to know your opinion on if it is better to travel from Hanoi to Saigon or Saigon to Hanoi. At that time of year it’s probably better to travel from Saigon to Hanoi, because of the weather. But in general, March, April, May is a good time to see the whole country. Tom, you rock! Thanks so much for all your insight and tips – deeply grateful. I’m planning on doing a solo trip in Vietnam in February for somewhere between 2-3 weeks. Novice to biking and aware that the south would generally have the most favorable weather, what would you recommend doing? I’d love to go from Saigon to Hanoi and get a better feel for the country, but if not biking what would you advise? With 3 weeks you can ride Saigon to Hanoi – take a look at my 5 Suggested Routes here, which include rough estimates of time. You’re right, the weather will be better in the south at that time of year. But if you start in the south, then maybe by the time you get further north the weather will have improved. Another thing to be aware of is that the Tet Lunar New Year holiday is around early February in 2019. This can be a difficult time to travel in Vietnam, because everyone in the country is travelling, too – which can lead to very crowded roads and destinations. If you choose to stay in the south, you could consider riding all, or some, on mixing any of my Southern Routes together. A good example is the Tet Classic, but there are many more. Yes, you can return your bike to different locations as explained above. I think that an automatic is good for a first-timer because it is simple to ride and has no manual gears to operate. But automatics are heavier than manuals. You can contact the rental companies (also mentioned above) to ask them about which model bikes they have available and about which locations they can arrange pick up from. You can ride between Phong Nha and Hue – how long it takes depends on which route you go. If you take the Western Ho Chi Minh Road it will take about 2 days, but if you take the Eastern Ho Chi Minh Road, or Highway 1, of the coastal back-roads, you can ride it in one day. On some buses on some routes you can put your bike on a bus. Your site is hugely, hugely helpful, and I really appreciate all your insights! I’m going to Vietnam this Nov with my wife, and we’re both experienced riders so we’re looking to rent manual bikes. I’m also big even for a Westerner (6’2″, 240lbs), so I’m interested in renting something like a Honda XR 150, Honda Master, Honda FTR, etc.,. However, it seems like for all the newer Honda’s, both Tigit and Style warn that getting mechanic support outside of the cities could be spotty given parts could be hard to come by, local mechanics may be intimidated, etc. We’ll be riding from Danang up to Hanoi, through some pretty rural bits, so this has me worried. We both want manual bikes, and ideally something with good size and suspension, but don’t want to get stranded in the countryside because no one can repair them. What do you think? Any advice is appreciated! That’s a good question. I’ve never heard from anyone who’s had a problem with an XR in a remote area – they are very good, tough, reliable bikes. Mechanics would definitely try to help (even if they weren’t sure how to proceed), but Style and Tigit would know more about that then me. Try to squeeze a bit more info out of them – they both good, reliable companies, and I would trust their judgement. Definitely helpful =) The folks at Tigit were very helpful as well, we’ve gone ahead and reserved a couple of XR’s for the trip. Thanks for the vote of confidence in the XR, I wouldn’t imagine a newer bike like that breaking down that frequently either. Sounds like they were mainly warning away inexperienced riders or travellers without any mechanical capacity at all. Looks like my main concern will be flats, and that should be easy enough to deal with. 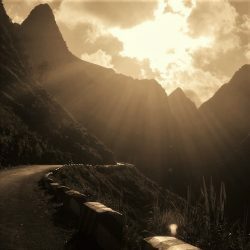 I’m wondering if 2 ppl on one scooter can do the Ha Giang Loop? Is it hard? I have 100Kg, my wife 50 and max 20 of luggage. As long as it’s a powerful bike and in good condition then there’s no reason why you can’t make it around Ha Giang with two people and luggage. Just make sure you get a good bike – check out the trusted rental companies that I recommend here. 22 days isn’t really that long if you want to go from south to north and do the Ha Giang Loop and take it at a leisurely pace. It depends which route you take, of course. But as an example, a long day riding on Vietnam’s roads (especially with two people and luggage) is anything betwen 150-300km a day. An easy and satisfying daily pace is to average 100-150km per day. But of course if you stop for a day somewhere then you have to make up the distance the next day. There is a big Ha Giang loop and a small? Trying to plan these 22 days. Can you help :)? We are beginners with the bikes. Planing to go between February and April .. or May …. I understand that the ha Giang loop is a Must! What do you recommend? North to South or better stay in North and Central ? You can spend as little as 2 days or as much as 5 days riding the Ha Giang Loop – there’s the main loop and then there are additional side route: see my full guide for more details. I recommend coming in late March, April or May, because the weather during those months should be better almost everywhere compared to February and early March. If you don’t care about beaches, then you can start your road trip from Danang and then head up to Hanoi and Ha Giang following any of my 5 Suggested Routes. But if you do like beaches then the south is better, so you could start in Nha Trang, for example. Yes, 26 days is a good amount of time to ride the Classic route. September is one of the best times of year to ride south to north, and October is still fine but by that time the weather might be changing in Central Vietnam and getting wetter. But in general the conditions should be fine. Typhoons can sometimes come in from the east during those months, but there’s nothing you can do about that – just hole up for a couple of days and wait for it to pass. I am thinking of doing a 6 week ride from Saigon up to Hanoi, and back down to Saigon. Do you think it is safe to do alone? I do not speak Vietnamese, but I want to take an adventure before starting school. Yes, Vietnam is generally a very safe country in which to travel. Just take all the normal precautions you would when travelling anywhere else in the world. In terms of riding, once you are out of the big cities the traffic is reasonably light, and all my motorbike routes try to stay off busy main highways as much as possible. 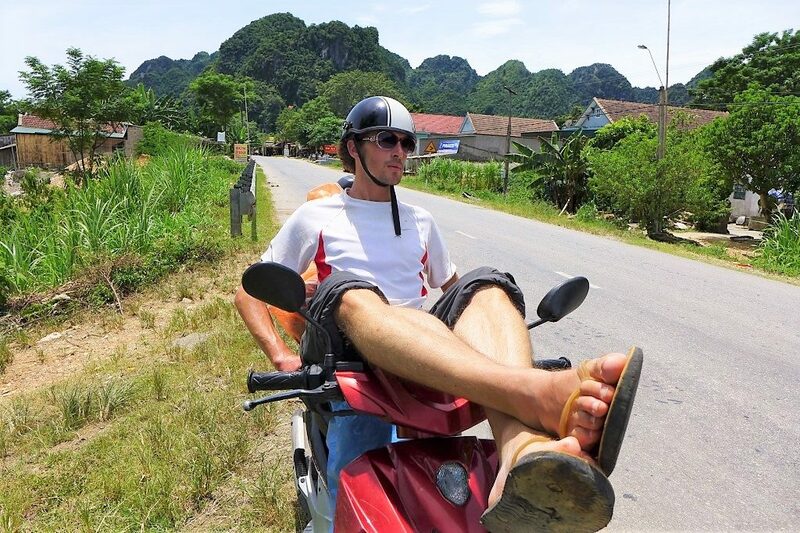 Of course, driving rules and culture in Vietnam are very different and obviously you should be extremely careful when riding a motorbike in Vietnam. But as long as you ride carefully and responsibly you should be fine. Also, Vietnamese people are generally very friendly and hospitable to foreign travellers, especially the further off the beaten path you go, so if you get lost or break down the chances are that someone will help you. Yes, it is possible. Try contacting the motorbike rental services listed in the sidebar and bottom of all my pages. You can mention Vietnam Coracle if you like, they know me. Do you know if it is possible to get 2 people and 2 60ltr backpacks on a bike. I ve scoured the internet to see if people have done this and I’m not sure it is really practical. If it is possible what bikes would be best to accommodate this setup. Would be planning on doing HCMC to Hanoi in January. Yes, it is possible, and it is OK as long as the bike is in good condition and some kind of rack is attached to it for the bags to be strapped to. Most of the recommended motorbike rental companies in the right sidebar and bottom of all my pages equip their bikes with such a rack. Try contacting them and asking. You can mention Vietnam Coracle if you like, they know me. 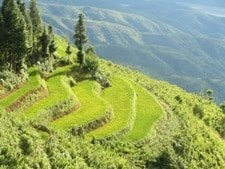 However, it also depends of the regions you will be riding in, and the season: if you’re planning to ride in very mountainous regions, such as Ha Giang, then the heavy load on the bike might take its toll after going up and down so many steep hills. And the issue of comfort with two people and luggage if you’re ridding in the hot and humid months should be a consideration too, if you’ll be on a long trip. Fantastic blog. Super helpful. Thank you very much for sharing. Quick question: you suggested about 3-4 days for the golden loop. What locations would you add if you can extend that loop to a total of 6 days? You don’t have much choice for stops between Prao and A Luoi, because there are no towns between the two of them. So you could spend an extra day in each of those places if you like – both of them are interesting, scenic and relatively remote off-the-beaten-path little towns. 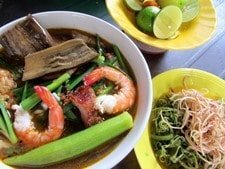 Other than that, you could stay an extra night in Hue – there’s lots to see in that city – and maybe spend a night on the beach on Thuan An Peninsular, or the lagoon south of Hue, or Lang Co. Also, Danang is a very interesting up-and-coming city these days, and then of course there’s Hoi An. Im thinking of going on a motorbike roadtrip from Hanoi to HCM. May i ask if you have international drivers license during your trip? I have a Vietnamese driving license. Rules and regulations regarding licenses are not set in stone and seem to be in a constant state of flux, and the vast majority of foreign riders in Vietnam do not have a local license. I would suggest contacting any of the motorbike rental agencies recommended on my site and asking them for more information. There are links to Tigit Motorbikes, Rent a Bike Vietnam, and Style Motorbikes in the right sidebar and bottom of all my pages. Oops… correcting myself.. since I will go to Sapa from Hanoi by night train. So, would any renting company be able to drop the bike to Sapa? I will return it when I get back to Hanoi. Also, for a bit more information about renting motorbikes, read this. You can rent your bike in Hanoi and put it on the train to Sapa (although it might go on a different train to you). Check out the links to the motorbike rental companies that I have in the right sidebar and bottom of all my pages: Rent a Bike Vietnam, Style Motorbikes, Tigit Motorbikes. They all have offices in Hanoi. You can mention Vietnam Coracle if you like, they know me. Im heading to Vietnam for 5 weeks at the end of September to film a solo motorcycle adventure documentary. I was planning on leaving from Hanoi and venturing through Cambodia and Laos while heading south to HCM. Do you think that I will have enough time to see these other countries or is 5 weeks only enough to explore Vietnam? Personally, I would spend all 5 weeks in Vietnam – then you will have time to explore the regions north of Hanoi as well as riding south to HCMC. 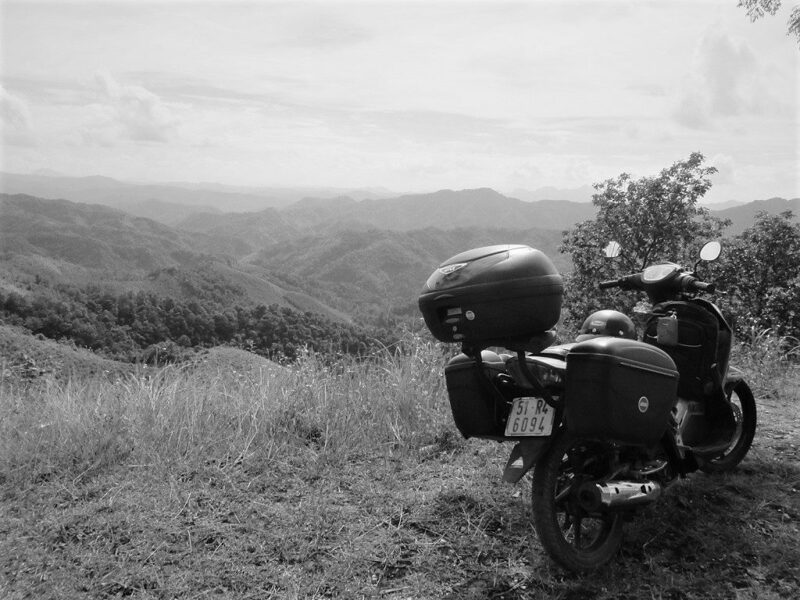 However, most bikers do rave about Laos, so I’m sure there’s some great riding to be had there too. Although the road network is not as extensive as Vietnam, and road conditions vary even more than they do in Vietnam. Check out Laos GPS for more about biking there. Thanks a lot Tom. I appreciate the advice. On another note… do you recommend buying a helmet there vs. bringing one? There are lots of helmets available here, of all varieties, so it’s not necessary to bring your own, unless you have very specific needs. Love your site, its very helpful in planning my upcoming trip in the north! Wonder if you know if its possible to hire a guide together with the motorbike at one of the bikeshops you mentioned, and if so, how much does it cost? I’d like to ride pillion with the guide as I’m not a very good rider and the roads in the north seem pretty daunting.. Rent a Bike Vietnam might be able to arrange a guide; it’s worth asking them. Most people who want to ride pillion tend to hook up with an Easy Rider: these are Vietnamese bikers with lots of road and travel experience who specialize in taking foreigners on the backs of their bikes around the country. There are quite of lot of similarly named groups out there now so do a bit of Google research first. Thanks Tom! One question, do you think it will be cheaper and possible to just find an easy rider in Hanoi compared to booking online? I’m not sure about Hanoi – I don’t know where they hang out there; probably near one of the bigger backpacker hostels in the Old Quarter. Certainly in Dalat it’s easy to arrange an Easy Rider when you’re there, so I don’t see why it should be any different in Hanoi. Hey crew in Ho Chi Minh I’m Marcus 39 Australian I’m riding to Hanoi starting today 10/8/2016 roughly 3 weeks Staying in Vun Tau tonight if anyone is keen to ride with me give me a shout. It’s fine to post a question like this here, but as I mentioned before, you are probably more likely to find other riders to join on the road by posting this question on the Vietnam Back-Roads Facebook page. Really love your blog! Thanks so much for sharing your experiences. -Roughly how long does it take to travel 100 km on the highways? I know this depends a lot on traffic and stuff but could you give me a rough guide? I know that’s a stupid question to ask cos it varies so much but i’ve been looking at folks who take a whole day to travel 100-150 km. What do you think? I was hoping you could cover that in 5 hours! Yes, you’re right, it does depend on the road you’re on. But in general, if you are on a good highway with reasonable traffic, you can expect to average 40km an hour. So 100km should take around 3-4 hours, including stops for gas, photos, maps checks, drinks, snacks etc. Leaving at 5:30am and keeping your average daily distance down to 100-200km a day is a smart thing to do if you have the time, and you’ll enjoy it all much more. Yes, Mui Ne is infamous for police stopping foreigners on bikes are then extorting all the money they possibly can. 500 is not so bad; it should be around 200-300 but don’t take it too personally – it happens to all of us at some point. I hope it doesn’t ruin the fun of your road trip. It was all in good fun, I expected that at some. Just wanted to provide an anecdote of what a police stop is like. This is not totally related to finances but if you are considering a trip, my opinion is that a mask with a clear face guard is the way to go. It will help big time in rain and also keeps down wind fatigue, possibly a little city pollution although not sure on that last part… you can also open it up if you want the wind in your face at times. Yes, clear face guards are good – as long as they’re good quality and don’t scratch easily. Personally, I wear sunglasses during the day and clear glasses at night or when it rains. 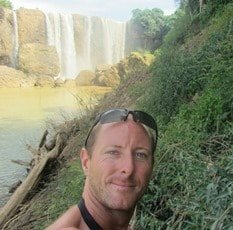 Hi Tom, Great post full of information and your price estimation will certainly help a lot.My friends and I are planning to have motorbike ride in Vietnam for next vacation.Can you please tell me which season or month it is most suitable to have motorbike trip and recommend me some place??? You can read about seasons and when and where to go in my Weather Guide. 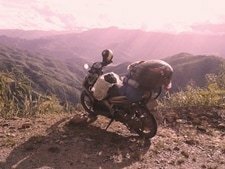 And for recommendations about where to go on a motorbike road trip I suggest that you browse through my Motorbike Guide Archive to get more of an idea of the kind of rides that appeal to you. Am thinking of doing the Hanoi to Ho Chi Minh City ride or the other way around. What months would be best weather-wise? 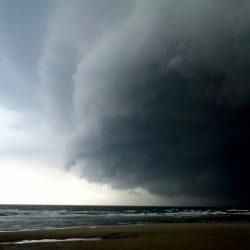 Vietnam has very complicated weather, so it’s difficult to generalize. But, nationwide, the best time is either late spring or autumn: April/May or September/October. For much more detail about weather and when and where to go take a look at my Weather Guide. Myself and four friends (from the States) are planning a three week motorbike trip from HCMC to Hanoi (roughly a la your itinerary). Having been to HCMC previously, I know how hellacious traffic is in Vietnamese cities. Do you have any recommendations for how to minimize risk while riding out of HCMC into the much safer countryside? Times of day, routes, etc.? We are using Rent-A-Bike and picking up the bikes from the Saigon train station on May 18. Our primary concern is maximizing safety while on the road! Further, we are all outdoors enthusiasts and are planning to camp out roughly two of every three nights on the trip as a way to save a bit of money and enjoy the terrain! Any advice on camping? Particularly nice spots you had along your route? Ways to not draw attention to ourselves? Logistical suggestions? We are planning on hammock camping! Sorry to inundate you! Your website has been a spectacular resource. Firstly, if you’ve been using my Scenic Route guide, take a look at my most recent post instead outlining 5 suggested routes from Saigon to Hanoi here. Yes, the initial 1-2 hours out of Saigon is ‘traditionally’ quite horrible – in any direction. However, you can minimize the ‘pain’ by leaving early (really early) in the morning – trust me, it’s worth it: leave at 4 or 4.30am and the ride will be much smoother. If you’re heading towards the coast from Saigon you can take the ‘Back Road’ out of the city to the highway, which involves a short ferry ride (it operates 24 hours). Just zoom in on the relevant parts of my maps in the previously mentioned Saigon to Hanoi routes guide and click on the map pins for links to more details on this or any other part of the route. For more information about camping see my camping guides here and check my replies to comments at the end of these guides as they contain some more tips. Even if you can’t find a good spot to camp for the night, you’ll never be too far from a cheap nhà nghỉ (local guesthouse) which I’ve written more about here. 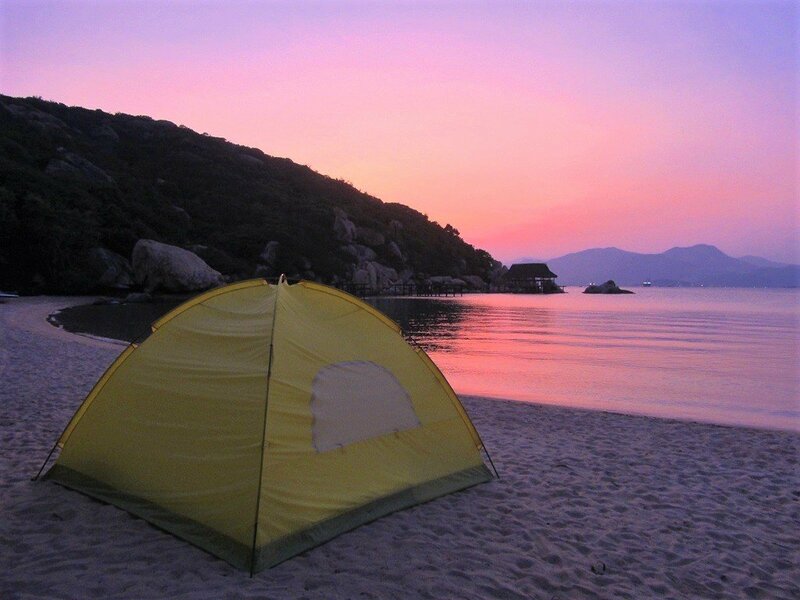 Particularly good areas for camping include the southeast coast and the Western Ho Chi Minh Road – again, just click the map pins on the Saigon to Hanoi routes and follow the links to more information on these areas. If you can’t find what you need, email me and I’ll answer your specific questions. I am moving to HCMC at the end of July. It would be great to meet up for a cold one. What district would you recommend for a Yankee to live in? One more is there a lot of people playing tennis? Thanks for all the information. Well, that depends on your budget and the kind of area you want to live in: if you like your western-style comforts then districts 2, 7 and 1 will suit you; but if you want to go a bit more local try Binh Thanh and Phu Nhuan districts. Also, you’ll want to decide between a house or an apartment: I prefer a house because there’s more space and more contact with the area you’re living in, but many foreigners prefer apartments because it’s more secure and convenient. Take your pick! As for tennis, what’s your level like? I play regularly with some good ex-college players from the US and Europe. Let me know if you’re around that level. If not, just try posting for tennis partners in the Expats Ho Chi Minh Facebook page. Hi, I am going motorbiking in Vietnam shortly, and I am still unsure whether to hire or buy a motorbike. I’ve heard stories of people hiring bikes, and getting charged ridiculous amounts of money by the hire companies for minimal damage (just a scratch), and I was wondering if this would be the case with the two companies you recommended? Also, another problem is that you can’t get personal liability insurance cover in the UK for motorbiking abroad, and so wouldn’t it be easier to buy insurance as part of hiring the bike, rather than buying a bike and then having to go and get insurance separately? I’m probably leaning to towards hiring rather than buying, but I just wanted to check these couple of things with you. Thanks so much! Hi, I just have one more question please – if I hire a bike, will I be able to pick it up in Ho Chi Minh and drop it off in Hanoi? Whether to buy or rent is a common question. In the past I would suggest that renting is better for shorter stays – of 3 weeks or less, for example – and buying is better for longer stays. But thanks to good rental companies, such as Rent a Bike Vietnam and Flamingo, who both offer pick up and collection in Saigon, Hanoi or Danang, it’s now even easier to hire a bike for your south to north trip (you can find a link to Rent a Bike Vietnam in the right sidebar and bottom of this page). However, thanks to Tigit Motorbikes it is now also very easy to buy a bike and sell it back, even for shorter trip of less than 3 weeks. This is because Tigit guarantees that they will buy your bike back once you reach Hanoi (or wherever it is that you’re going to). This means that their bikes are in excellent condition because it is in their interest to properly maintain them because they will be buying it back and using it again. It works like this: you pay for the bike – usually $1000 (sounds like a lot, but wait), then when you reach Hanoi they buy it back from you for $800 or $750 depending on the length of your journey and the period of time. It works really well – I’ve done it myself – and the bikes are much better than anything else you can buy for $200. Check out the Tigt Motorbikes website – there’s a link in the right sidebar and bottom of this page. I can’t really give you much help with the insurance – but it’s very difficult to get covered for motorbiking in Vietnam, without paying a premium for it: it’s worth it, of course. Tom do you know if a international lic. is now valid in Vietnam or not? I have found mixed information on line. Yes, that is THE question. 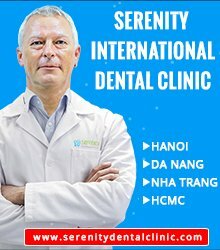 There’s always talk about international licenses being accepted, but to the best of my knowledge they are still not officially valid in Vietnam. However, this should not stop you from undertaking a motorbike road trip in Vietnam – the standard fine is 200,000 ($10) if you are unlucky and get stopped by the police. Yes, renting a bike probably would save you some hassle. Try Rent a Bike Vietnam (you’ll find a link to them in the right-hand sidebar and bottom of this post). They should be able to sort you out a good bike and some saddle bags to carry your stuff, or at least some advise about how/where to get a rack fixed. You can mention Vietnam Coracle if you like, they know me. Yes, it’s not too difficult to buy and sell bikes in Vietnam. You can check noticeboards in backpacker hostels, cafes and bars or try the Expats Ho Chi Minh Facebook page too. The same goes for selling the bike. However, this process may bite several days into the beginning and end of your trip. I recommend renting a bike instead: you can easily rent from Saigon or Hanoi and then return it either in Saigon or Hanoi at the end of the trip. Good bike rental companies include Flamingo Travel and Rent a Bike Vietnam – you can mention Vietnam Coracle if you like, they know me. In general, the best way to do the route is to stick to the coast in the south and head inland to the mountains from the centre to the north. Take a look at this route map and click on some of the links to my motorbike guides to get an idea of what where everything is. Also have a look at my North-South Archive. I am planning to drive to hanoi from Mui Ne so I’m going to buy a bike in Mui Ne. Do you think an automatic is ok or should i buy a semi-automatic? I heard that to going to Da Lat the road are very up and down and it coast me more fuel with an automatic. But i never drive a semi-automatic before. Can you give me advice about what do think i should buy? Thank a lot for your information. It’s so useful for me this time. I’m planing to travel from Ho Chi Minh to Ha Noi by motorbike on October. But It’s quite not easy for a girl . So I’m finding a partner who wants to travel like this to go together. However, not yet found. 🙂 By the way, thanks again. Yes, I understand. You might be able to find someone while you’re in Ho Chi Minh City. Or you can trying posting on social media like Couchsurfing, Expats Ho Chi Minh facebook page etc. Thank you. I have more motivation from your post. Plan and do it. Your blog is a find! I’ve already sent the link to 12 people who are going to vietnam this year. We are going to Vietnam for the month of November and were looking to kayak around Bai Tu Long Bay and Halong Bay but now are considering motorbiking your northern route and the falls. How hard to learn to ride a motorbike like the one in the photo. I’m a cyclist and the last time I had a dirtbike I was 15. Thanks. Learning to ride a bike like mine is very easy. You’ll already have the balance from riding a bicycle. My bike is an automatic so you literally just turn the key and it goes. Gears are automatic, and brakes are the same as a bicycle. However, road ‘rules’ in Vietnam are difficult to get used to, especially in the city. But once you are out in the countryside it shouldn’t be a problem. What a lovely site you have built. I am planning a motorbike trip next week, as a pillion rider. Haven’t ridden in a while. Maybe I’ll ride next time. Your estimates are very helpful. Planning a ride slightly north of and around the Mekong Delta, starting in HCMH. I bought my tent in London 🙂 But you can get decent tents in Saigon at Lều Du Lịch Trúc Linh in Go Vap District – this is their website. 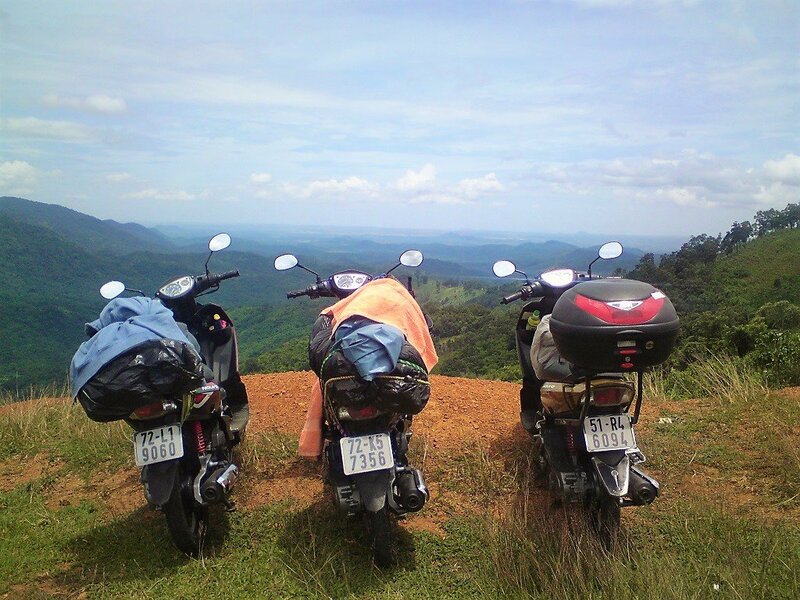 Me and 3 mates travel to Ho Chi Minh this Satruday, we are buying motorbikes and driving up to Hanoi. Do you have any recommendations on where to buy our Bikes in HCMC? There are usually bikes available to buy on Criagslist and there are also bikes regularly advertised on the Facebook page for Expats Ho Chi Minh City. It’s a good idea to join that page and post about buying a bike and see what comes up. You can also try some of the more reputable bike rental places is Saigon – they often have bikes for sale too. Flamingo Travel has an office in Saigon now and I think Saigon Scooters might have some for sale. …sorry I got cut off an the end of the previous reply. Check the noticeboard at popular guesthouses and bars in Pham Ngu Lao (Saigon’s backpacker district) – there are usually bikes for sale there. A legend indeed… Nice shots, too. Another great post from The Vietnam (C)oracle! Don’t wait too long for your return trip out here! What a useful piece of information, Tom! When I did the motorbike trip with my friend Kevin last year, I had to send him a similar list of expenses prior to his arrival in Vietnam. From now on, if any of my foreign friends ask me for helping with this, I just simply share your post :). Yes, I hope it’ll be a useful guide for anymore considering a road trip in Vietnam. Of course, prices will go up year upon year, but in general this has been how much I’ve spent on most of my road trips. No mention of obtaining a Vietnamese driving licence. In Dalat recently they wouldn’t hire you a bike without one. Although you can get round this, if you have an accident and you haven’t a licence, any health/accident travel insurance won’t pay out. I heard of travelers who did get around it, had an accident and the police confiscated the bikes. VND3m to get each bike back! Thanks for another useful post. Yes, that’s right. But, it is still quite unusual to be refused rental without a Vietnamese license, even the most professional bike rental services accept that the process of obtaining one is rather long-winded and most travellers do not have the time to do this. However, things are getting better, and there are rumors that soon an international drivers’ license will be accepted in Vietnam. As for travel insurance, you are right again. But as travel insurance is for the whole trip – not just for the road trip – I consider this a general expense, just as airfares etc. As for the fine, this is definitely a chance you take when riding in Vietnam. Most reputable rental companies will give you their contact number so that you can call them if and when you encounter the traffic police. However, even with all necessary documents – license, ownership papers, visas, insurance – which I currently possess, the police can still extract a bribe from you – sometimes it hasn’t nothing to do with breaking the law. Thankyou for your guides. You are a legend! I have been thinking about next (4th) trip to VN, and you have inspired me to bike it. Thanks. Great to hear that you’ve decided on a road trip for your next visit. I hope it works out well. The ultimate comfort food for me in your photo. I will be there soon enough in 5 weeks. Will be looking for those dishes often. I hope you find that meal, and that it doesn’t cost you $20! Fast forward one year to 2016. I have booked for another 3+ weeks. Will be taking it easy this year, not like last year where I switch cities every 2-4 days.